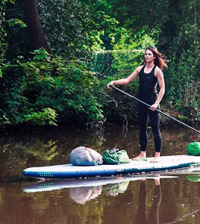 Stand Up Paddling (SUP) is the fastest growing water sport in the UK, with exciting and different variations available including SUP yoga, SUP marathons, SUP surfing and SUP racing. 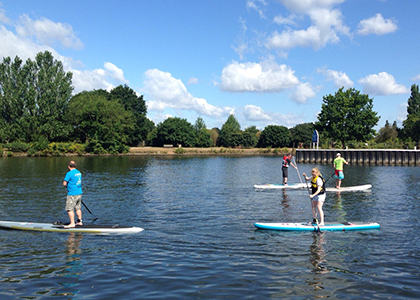 SUP is great for the sporty-woman, and ideal if you’re looking for something that will improve your balance and co-ordination and provide fun at the same time. 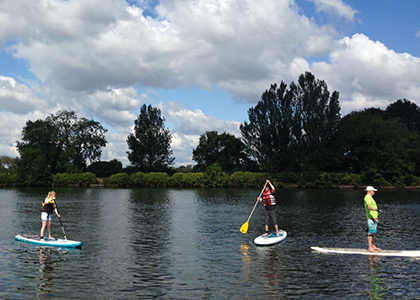 Sacha Shipway tried out SUP at Blue Chip School in Surbiton and here’s what floated herboat. Stand Up Paddling (Paddleboarding) is exactly as it sounds – you stand on a board and use a paddle to navigate around open water areas. SUP has been around for thousands of years and is believed to have originated in some form in ancient cultures from South America to Africa. There is a sense of utter freedom paddling around while standing up and the different perspective gives you a whole new take on the world, all this whilst also maximising core and ankle stability. After being taught how to carry the board, attach my ankle strap and the basics paddle technique on land, I eventually got out on the board (beginning with calm water). 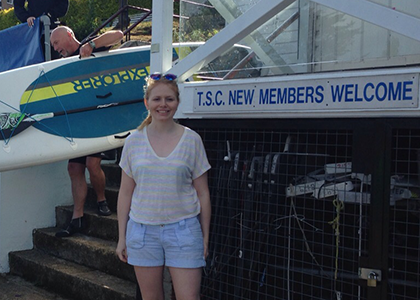 We started by kneeling on the board and getting used to the motion and paddle – then it was time to get standing. This was the point at which I resembled the hunch back of Notre Dame – very tense, and very tentative! However, after easing into it (slowly) and learning how to relax, I realised how much fun and how freeing SUP can be. It’s totally different to anything I’ve tried before and it’s relatively easy and quick to learn. 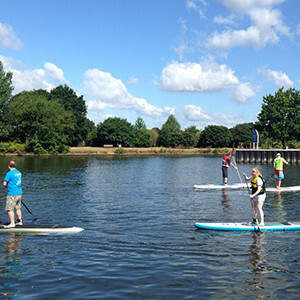 SUP is highly recommended for sports rehabilitation; one of the instructors had, had shoulder surgery with an expectation of regaining only 75 per cent mobility post-surgery, however, through SUP he regained 95 per cent mobility and learned a new sport. For me personally – I could certainly feel the benefit in my ankles from having to constantly reconfigure my balance. It’s important to not be afraid of falling into the water, because then you’ll take more risks and be more creative as a result. The instructors gradually introduced me to new techniques to help me improve my form. This involved learning how to correctly use the paddle by digging deep in the water, and learning to change direction. I really enjoyed SUP and would be interested in SUP racing as a next step because I think the speed and challenge to maintain balance would be exhilarating. I’m sure that I barely scratched, or paddled on the surface of SUP and that this sport has plenty more to offer. The only downside is that if you did get into it you’ll need to buy a board (new cost from £399.00) and have a way of transporting it! But there are loads of hire places popping up – so get out and give it a go.